Is there anybody out there that does not love 7" vinyl records? Even the young metalheads are pretty aware of this re-activated 'habit' to have brand new bands releasing their efforts in a 7" record featuring one track in each side. It is very different when this is compared to a CD single; when you are holding the vinyl product you actually feel the fatigue, the sweat and all the effort the band has put while being in the studio. The mechanical pressing of the vinyl brings you closer to the human factor that is simple absent in all CD discs. There you have a mass production of a plastic case totally stripped of all the feeling a fresh band invests in a debut release. 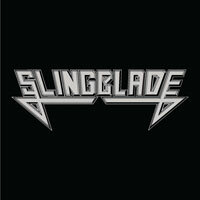 Well, this is exactly the case with SLINGBLADE; a band from Sweden that bears the killer NWOBHM atmosphere giving the impression that this is a re-release. Little information is available regarding the biography of SLINGBLADE but this did not matter as the needle in my turntable touched and precious surface of the 7" letting out the first musical notes of "Can't Get Enough". The almost "Remember Tomorrow"-ish clean guitar intro invites the distortion to embark into a time travel with the company of early AC/DC (Bon Scott days), prime SAXON and of course GIRLSCHOOL. The latter reference is by no accident since the female vocals by Kristina Karlsson have an addictive timbre that shows towards that direction. The song structure is simple with the classic power chords and the mighty pentatonic scale making the result really impressive. From time to time we need a straightforward reminder that this is the way to make expressional music full of emotion. This is the music to tap your foot, to drink your cold beer and enjoy the company of friend in a dim lighted bar. The second side of the vinyl record (I just love writing these words) is more guitar-oriented and I believe hides some Rory Gallagher influence or even some THIN LIZZY one. Don't get me wrong; this is not a Hard Rock release or a cheesy 70's oriented psychedelic thingie that I do not understand. The two songs are soaked in the 80s British Metal blend carrying all the NWOBHM values with a tension to be listened mostly by tribute bands or dedicated nights in local Metal bars. Personally, I wish that SLINGBLADE will deliver a full length album so we can dive even deeper to the time travel really soon. On the other hand, if this is the only release then the 500 copies of the 7" will be not enough! Invest, your eyes closed!